In a previous blog post “A camera does not make a photographer” I spoke about the various aspects of a photograph, among them the idea of composition. Many times photographers, myself included, see things a certain way but fail to look at it from a different perspective. Concentrating on a fixed perspective leads to missed opportunities for fantastic images. This reality hit me many years ago when a colleague asked me to critique some of his photographs. He had just bought a camera for use as a part of his 3D modeling business and was just learning how to use it. Reviewing his images I found myself fascinated by his approach to photographing seemingly simple subjects from different angles. Since that time I continually make a concerted effort to not only get the shot that I’m looking for but also trying to look at things from different perspectives. As part of a photography group challenge each person would select a subject and photograph it from a variety of angles and present 3-5 images. As simple as that may seem it can be extremely difficult. I really struggled with deciding on a subject but finally settled on a bottle of wine. Let me tell you it was not easy coming up with even 3 images. The first image I came up with was of the seal on the top of the bottle. The intent was to keep this image very abstract not providing the viewer a lot of detail about the subject. In order to help isolate the seal I shot the image in a dark room using just a small light to illuminate the seal. 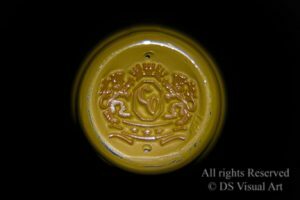 As you can see from the image the stark contrast of the seal color and the black background help maintain focus on the details of the seal. For the next angle I laid the bottle on its side. Again using a small light to illuminate the bottle, direct lighting results in nice separation of the bottle from the background. With a shallow depth of field I was able to give the viewer more detail of the bottle while keeping the label out of focus. This angle provides a clearer view that this is a bottle of wine, while the details of the wine are unclear. As with the first image the dark background and direct lighting provides a great deal of contact for the image. In order to provide more of a vintage feel the photograph was processed using a sepia tone. 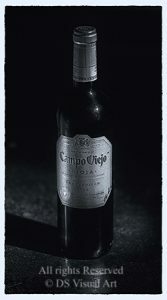 For the final image I photographed the bottle straight on using several direct lights and backlight creating a very dramatic effect. The backlight provides additional separation of the dark wine bottle from the background. 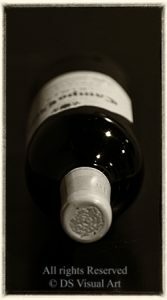 Likewise the direct lighting provides highlights on the sides of the label leaving contrast on the center of the label. The intention of using this angle was to two-fold. First provide greater details about the wine for the viewer. The second was to set the image mood. Wine is often associated with a quiet, relaxed atmosphere. The deliberate lighting of the label and backlighting of the bottle help accentuate this mood. The only thing that might have helped set the mood would have been a fireplace. At DS Visual Art providing fine art photography is a passion that we take very seriously. From the initial concept to final product we strive to provide the highest quality to our customers. This includes making sure that we photograph every subject from the optimal angle. I hope that you’ve enjoyed this post and that you’ll subscribe to our site for future updates.